HomeBlockchain 101What is Blockchain Technology? 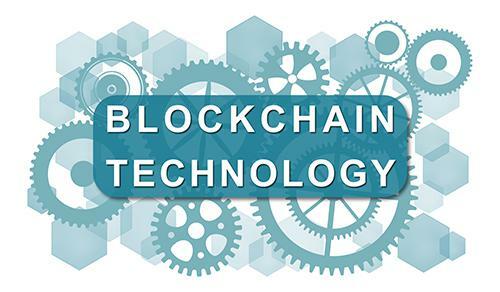 A blockchain is a decentralized, distributed, public ledger of transactional data secured by cryptography. Transactions are grouped together in blocks and linked together in a chain to create an immutable ledger that is (nearly) impervious to fraud. Now, in case that definition wasn’t very clear, we’ll break it down into more digestible pieces. What Makes Blockchain Technology Unique? Are Governments Trying to Regulate Blockchain? Blockchain is built on a distributed ledger. That means that the technology is built on a P2P network and a ledger records the transactions among the participants of the network. People in the network agree by consensus to any updates in the records (or transactions) in the ledger. This consensus makes the records reliable. These records are also immutable, meaning they can never be erased. Blockchain was developed in 2008 by a person or group of people known as Satoshi Nakamoto for implementing the digital currency bitcoin. That name is a pseudonym – the real name of this person or group of people remains unknown. The blockchain technology is built upon the idea of decentralization, allowing users to interact without the use of an intermediary. Many believe that it was developed as a reaction to corruption in the banking system realized in the years following the housing bubble burst in the United States in 2007. The financial systems we use today are centralized systems, such as banks, credit card companies, and payment processors. These systems function as third-party intermediaries to help facilitate transactions between parties. Although centralized systems have benefits, such as trust, efficiency, scalability and profitability, these third-party intermediaries also take a cut from the transactions. In addition to high fees, these intermediaries also lengthen the transaction process by anywhere from a few hours to a few days. For example, consider both the fees and time involved in wire transfer and the exchange of property. Blockchain technology removes the need for these intermediaries and creates a system of digital trust. It uses a network of computers called nodes to validate transactions and keep an accurate record of their history. This leads to quicker transactions times, improved data accuracy, and minimal costs. Since it creates a system of digital trust, the blockchain also enables the anonymous exchange of digital assets. — Vitalik Buterin, co-founder of Ethereum. Since blocks of identical information are stored across the network, it makes it impossible for them to be controlled by a single group (and get into the wrong hands). Even more importantly, everyone can use the blockchain and help run it. Another way to think about blockchain is to compare it to a distributed database or spreadsheet, open to everyone. The sheet is shared thousands of times across a network of computers to ensure the latest version is available to everyone. The data and records are safe since they don’t have a central point of location which can be easily hacked or made corrupt. There are a few different components in a blockchain that you should learn about to fully understand how the technology works: nodes, blocks, hashes, and digital signatures. As mentioned earlier, nodes are the computers that run and maintain the blockchain network. These nodes voluntarily join the blockchain as “administrators.” They often have an incentive in joining – for bitcoin applications, the incentive to join the network is to be able to win bitcoins. Each node has a copy of the ledger of transactions and they continually check the validity of new transactions that are being added. Since the transaction history is distributed across a network of nodes, it’s nearly impossible to maliciously manipulate it. The ledger is maintained with majority agreement, so any user would need to control at least 51% of the nodes on the network to make a change. Transactional data are the building blocks of a blockchain (pun intended). This data includes the source of a transaction, the recipient, and the amount being sent. A timestamp may also be included. Sets of transactional data are grouped together in blocks and picked up by the network nodes. Once confirmed, a block is attached to the chain of already confirmed blocks. This is the blockchain. New blocks can be added to the blockchain by undergoing a process called Proof of Work for each new block. This is a mechanism which slows down the creation of new blocks and prevents malicious manipulation of the blockchain. Anyone wanting to tamper with the blockchain would need to recalculate Proof of Work for every block on the blockchain. 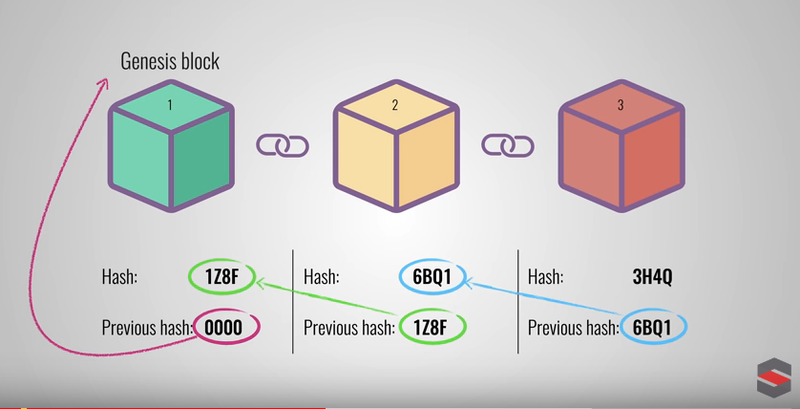 Each block on the blockchain is run through a hashing algorithm. One type of hashing algorithm is SHA-256, a member of the SHA-2 cryptographic hash functions designed by the NSA. (SHA stands for Secure Hash Algorithm). This produces a unique identifier, a hash, for each transaction that’s a fixed length of characters. Think of a hash like a fingerprint, able to identify a block and all of its content. Instead of having to keep track of all the transaction data, however, you just need to know the hash and previous hashes to prove the legitimacy of the transaction. 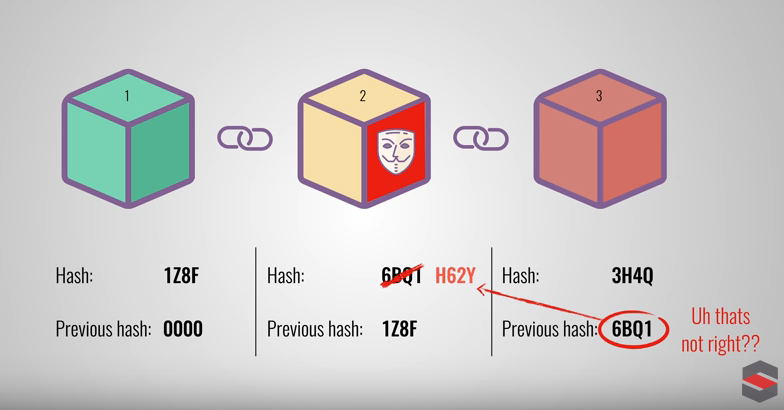 How can you verify the legitimacy of the hash and previous hashes in the blockchain? Each block has a hash made from the transactions in that block plus the hash of the block before it, the hash pointer. These hash pointers are what secures the blockchain. If you were to change the data in any previous blocks, however, it would cause a chain reaction of different hashes and hash pointers ultimately revealing that there was a change. Even a change to the genesis (first) block, would reveal itself. That’s the beauty of hashes and the reason blockchain transactions are immutable. Digital signatures are proof that the person is who they say they are and not a hacker. Instead of real signatures, however, which can be easily forged, digital signatures use cryptography or math. Digital signatures are necessary to send and receive data on the blockchain. A digital signature is comprised of a public key and a private key. The two are connected through a mathematical relationship and form a key pair. The public key is used to receive data and funds from other people on the network. Public keys can be shared freely. Private keys, on the other hand, should never be shared. This is what senders use to sign transactions. 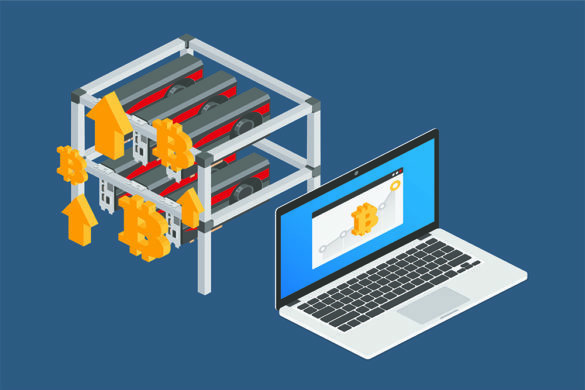 When sending a transaction, the nodes confirm that a sender is who they say they are through the connection of key pairs. They validate that the private key used to sign the transaction matches the public key listed as the source. Blockchain technology began as a financial tool with bitcoin as its main application, but has begun expanding rapidly into other areas as well. On the financial side, banks have begun partnering with blockchain companies such as Ripple to make their global payment systems more efficient. 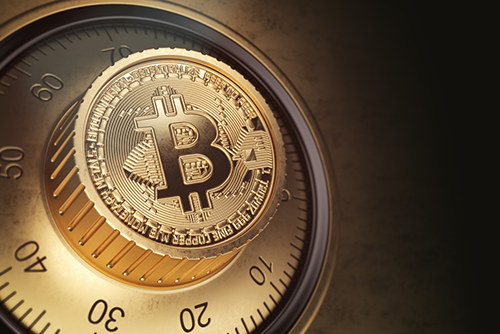 Several stores and online retailers have also begun accepting cryptocurrency as a quicker, lower cost way to receive payments. Other blockchain companies are working to make cryptocurrencies more spendable. 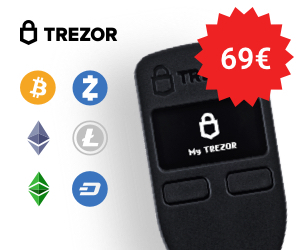 They’re creating gateways in which you can spend whichever coin you hold regardless of whether or not the store you’re shopping at accepts it. Another popular use-case for blockchain is the storage and transfer of data. Industries in which data accuracy and trust are crucial (medical records, land grants, and supply chain to name a few) have started incorporating this technology into their systems. Other companies are using blockchain to create decentralized file storage. Think Google Drive or Dropbox, but with the ability to loan out the spare space on your computer to other people. 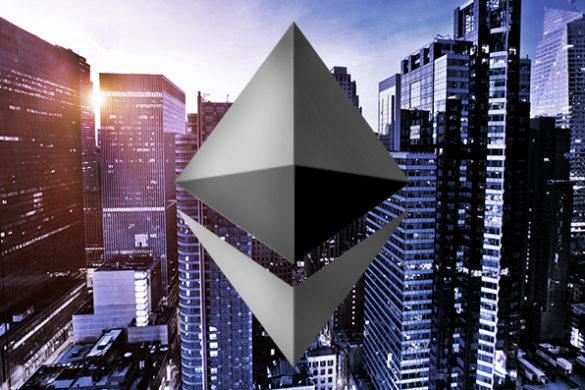 The creation of Ethereum and implementation of smart contracts opened up the world of blockchain to more than just transactional data. Simply put, smart contracts use computer programming to execute the terms of a contract. There’s really no limit to what smart contracts can be used for. They’re now found in gambling, loans, solar energy, decentralized exchanges, video games, and the list goes on and on. Blockchain is still in its very early stages, and it remains to be seen how it will disrupt all types of industries. 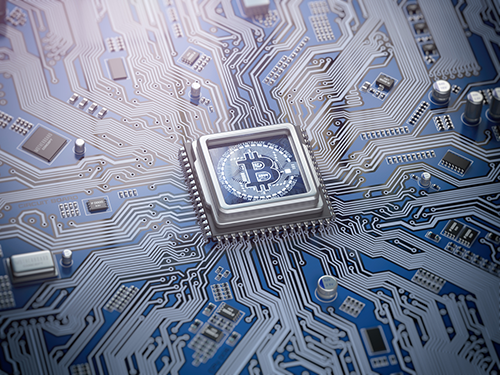 Blockchain enthusiasts and free-market proponents insist that it should be allowed to evolve freely, and any future regulations should carefully distinguish between the platform and any applications that run on it (bitcoin is currently the most popular). In the meantime, some regulators have already been at work ensuring that the technology is at least recognized as a legitimate financial transaction. Eight US states have been working on legislation that promotes the use of blockchain in 2017. Vermont has passed a bill that gives blockchain-notarized documents added legal bearing in the court of law. Arizona, Delaware and Nevada have done the same. The European Union has a positive and welcoming approach to blockchain technology. It both encourages exploration of the technology to test current laws and practices while at the same time giving confidence to entrepreneurs that their technology will be approved in the market. For these reasons, Europe may become a prime destination for blockchain development in the future. Switzerland is now one of the biggest promoters of the technology with the help of the Crypto Valley Association, a non-profit blockchain and cryptographic technology ecosystem. As distributed ledgers validated by a network of computers, blockchains are more secure, quicker, and cheaper to use than the current systems in place. From payments to supply chains, nearly all industries are beginning to use blockchain, and it looks like the technology is here to stay. Blockchain is expected to disrupt not only the banking and financial industries, but also cybersecurity, supply-chain management, forecasting, networking and IoT, insurance, private transport and ride sharing, and charity. The blockchain can increase trust and transparency for these industries. It’s important that these applications be fully explored and allowed to develop. There are a few additional industries that are also ripe for disruption and also have technologies teaming up with them. Blockchain is the technology behind all cryptocurrencies such as ethereum, bitcoin, ripple, tron, qtum, neo, litecoin, bitcoin cash and many more, but the financial industry is only one of the applications. The change these applications across many different industries will bring to our day-to-day life will be enormous. Many people compare it with the change that the internet brought to technology in the 90s. As additional blockchain applications become more and more mainstream, they will transform all areas of modern life. It may take time before this happens, but when it does it we will be able to welcome a world of secure, anonymous, and decentralized transactions.